Grand Marnier Chocolates - Do You Know The Muffin Man? Notes: I wasn't too pleased with these chocolates. There isn't a very strong orange flavour, only alcohol. Steeping some orange peel with the cream would have helped. I found it best to freeze the filling for at least two hours before cutting squares. Otherwise, the ganache tends to stick to the knife. The tops were decorated using a transfer sheet, acetate that is printed with coloured cocoa butter. 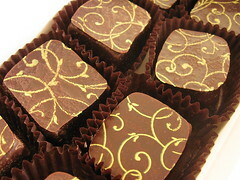 Recent warm weather made it difficult to hold these chocolates at a cool room temperature. Quite a bit of sugar bloom was evident after letting the finished product sit overnight.